Every year, millions of monarch butterflies leave their homes in the US and Canada and migrate south, spending their winter in Michoacán, a state in central Mexico. Upon arriving, the butterflies seek refuge in the oyamel tree, a "sacred" fir native to the region. They swarm the oyamel forest en masse and shroud the trees in thin, undulating veils of amber, an awesome sight to behold. 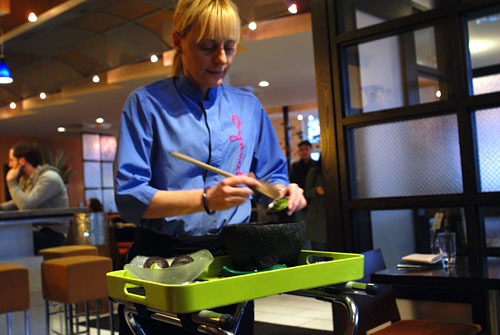 Such is the inspiration behind Oyamel, José Andrés' pan-Mexican eatery. 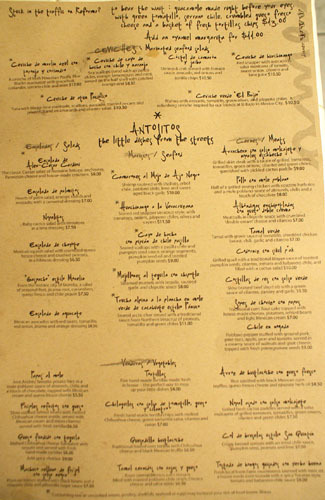 Prior to the restaurant's debut, Andrés embarked on numerous visits to Mexico, even meeting with noted Mexican cuisine expert Diana Kennedy at her home in Michoacán, in order to better understand the vast culinary heritages--pre-Hispanic, colonial, contemporary--of the country. Oyamel opened its doors in October 2004, not in DC, but in Arlington, VA. 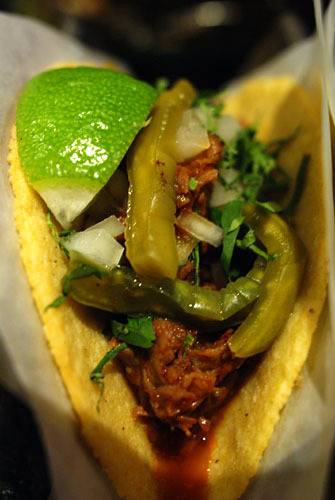 It wasn't until January 2007 that Oyamel relocated across the Potomac to Downtown's Penn Quarter (in a space formerly occupied by another Mexican eatery, Andale). Interestingly, the old Oyamel space was eventually taken over by Roberto Donna's Bebo Trattoria (which has since shuttered). Oyamel is currently helmed by Chef de Cuisine Joe Raffa, along with Sous Chefs Luis Montesinos, Omar Rodriguez, and Georgi Yanev. 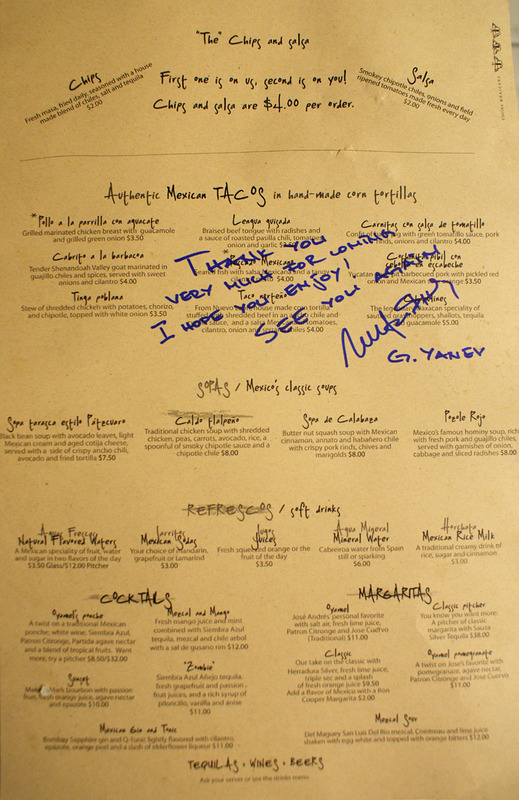 It was Yanev who came out to greet us on this particular night, which, coincidentally, happened to be his very last with the restaurant. Yanev is, in fact, moving to LA to work at Andrés' Saam/The Bazaar--I'll be sure to look out for him next time I'm there. Crafted by design firm Adamstein & Demetriou, Oyamel's interior space is fun, festive, and inviting, shaded in hues of monarch orange. The ceiling is home to oversized metallic butterflies, which flutter overhead in two giant swarms, a more obvious nod to the source of the restaurant's name. One side of the room houses the bar, while the other features the main dining area, as well as the six-seater ceviche stand. In the back, there's a more sedate, more formal red-hued dining room, which can be used for private events. 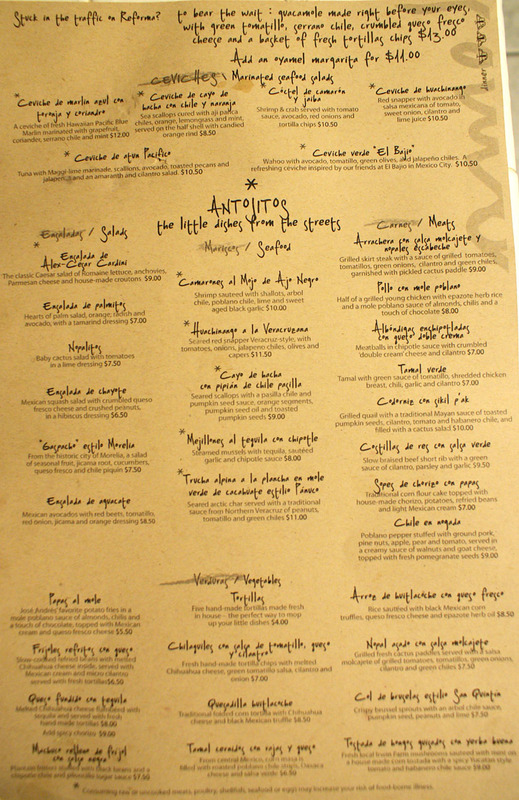 The menu features a wide array of graze-friendly Mexican-inspired fare, mostly in small antojito-sized portions meant for sharing--think Mexican tapas. Click for larger versions. Cocktails, natch, to drink. 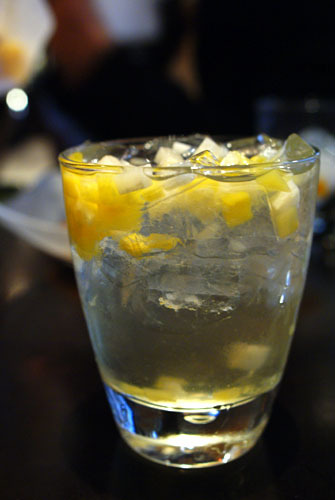 I went with Oyamel's Ponche [$8.50], the restaurant's twist on the traditional Mexican libation, made with white wine, Siembra Azul, Patron Citronage, Partida agave nectar, and a blend of tropical fruits. It was a delicious, refreshing, fruity, saccharine concoction that recalled sangria. 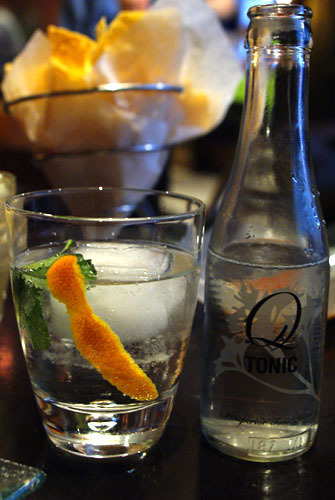 My dining companion had the Mexican Gin and Tonic [$11], comprised of Bombay Sapphire gin, Q-Tonic, cilantro, epazote, orange peel, and a dash of elderflower liqueur--think of your standard G&T, but with added layers of complexity thanks to the citrus, epazote, and elderflower. We were quickly brought the ubiquitous combination of chips and salsa. 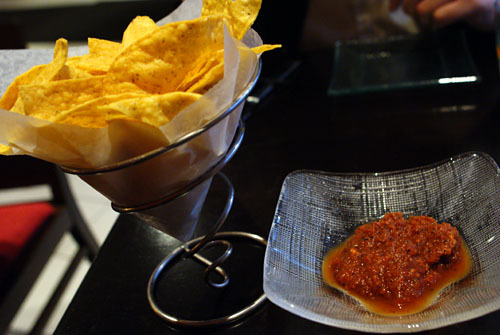 Oyamel's tortilla chips, seasoned with chiles, salt, and tequila, were tasty, but unremarkable. The salsa was far more interesting; made with chipotle chiles, onions, and tomatoes, it was much smokier that your typical condiment. Refills of either chips or salsa can be purchased for $2 a pop. 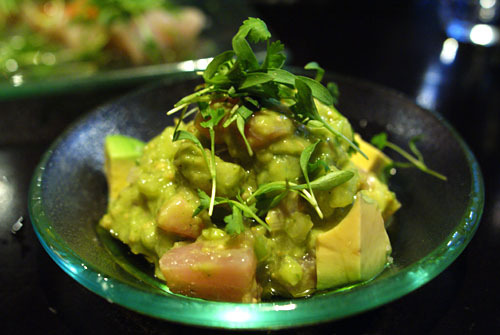 One of Oyamel's most well-known dishes is its guac, and for good reason. Created tableside from an amalgam of green tomatillo, serrano chile, onion, and crumbled queso fresco, it was easily one of the best versions I'd ever had. I loved how everything just worked together so seamlessly--the spicy kick of the chile, the weight of the cheese--it was fantastic. 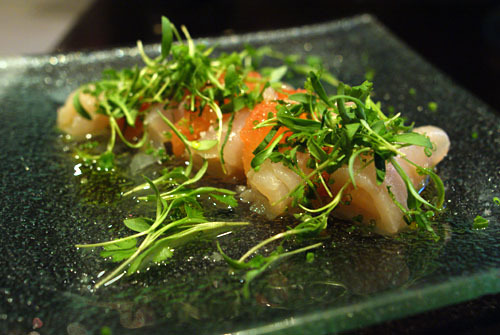 The first of our two ceviches was based on Hawaiian blue marlin, a fish that I don't see on menus all that often. Served in rolled form, and accompanied by suprêmes of grapefruit, coriander, serrano chile, and mint, it was a light, bright dish that really perked up my taste buds. The delicate, clean sapor of the marlin went surprisingly well with the sweetness of the fruit, while the chile added delightful pricks of heat into the equation, tempered by the sprigs of mint. Next up was a wahoo ceviche (inspired, apparently, by El Bajio restaurant in Mexico City), with avocado, tomatillo, green olives, and jalapeños. This was a weightier presentation of fish, with the firm, dense wahoo playing beautifully with the luxuriousness of the avocado. The jalapeños, meanwhile, added some levity to things, making for quite a stellar dish overall. 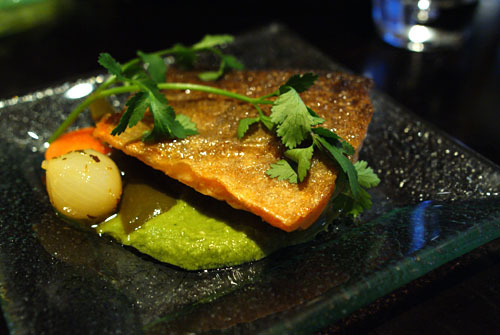 Hailing from the city of Pánuco, Veracruz, our first cooked course was the grilled Arctic char, served with a mole of peanuts, tomatillo, and green chiles. Here, I really enjoyed the fish's delightfully rare flesh, fantastically crisp skin, and how its oily, briny, salty essence was not only preserved, but highlighted. The char was delectable on its own, but the nutty, zesty mole was a superb complement. This was grilled quail with an ancient Mayan sauce of toasted pumpkin seeds, cilantro, tomato, and habanero chile, stuffed with a cactus salad. I couldn't help but compare this to the quail dish I had not too long ago at Rivera. 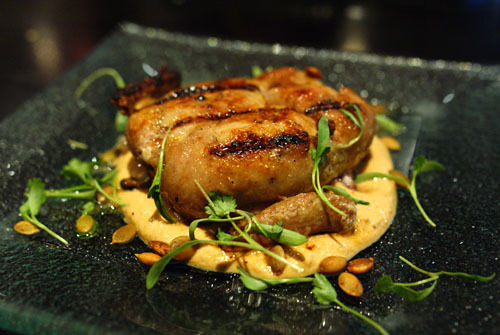 The bird itself was superbly done--flavorful, tender, and succulent--just like at Rivera. Its accoutrements, however, were what made it better: the interaction between the quail, the earthy sikil p'ak, and the zesty cactus was phenomenal. 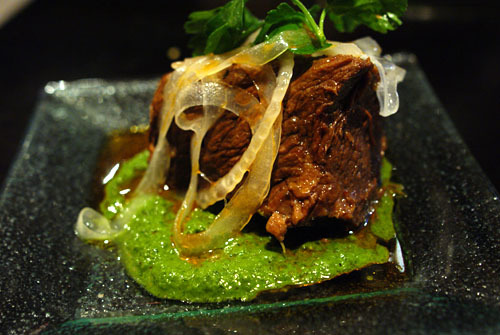 The last course before our taco gauntlet was this chunk of slow-braised beef short rib, with a green sauce of cilantro, parsley, and garlic. As a good preparation of braised beef should be, the rib was demonstrably soft, yet slightly fibrous, making for a fabulous chew. Its taste was characteristically beefy, dark, and delicious, beautifully countered by the light, piquant sapor of its accompanying salsa verde. 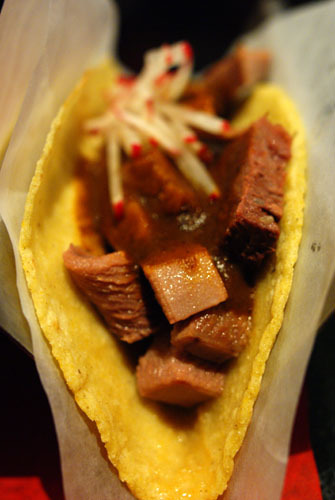 First up was tongue: braised beef tongue with radishes and a sauce of roasted pasilla chili, tomatoes, onion, and garlic. I found the meat surprisingly tender, and subtle in flavor. 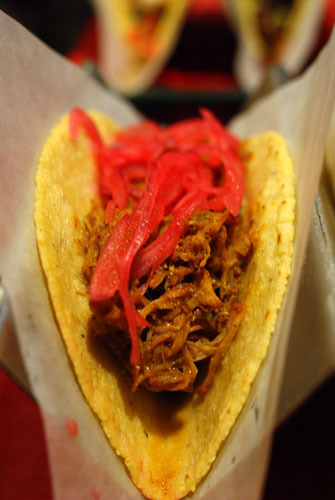 The key here, thus, was the taco's earthy, yet delicate dressing, a superb complement to the beef. 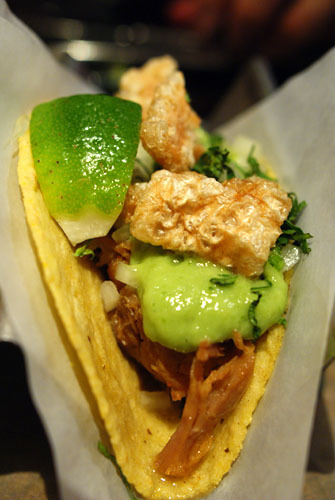 This was confit of baby pig with green tomatillo sauce, pork rinds, onions, and cilantro. Tender bits of pork here, served with a creamy, subtly spicy sauce. I really appreciated the crunch added by the pork rinds. 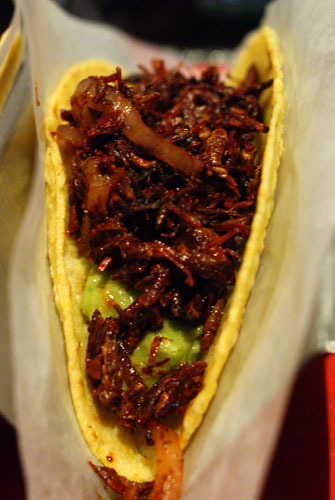 Cabrito refers to goat meat, here specifically, Shenandoah Valley goat marinated in guajillo chiles and spices, served with sweet onions and cilantro. I quite enjoyed cabrito's prototypically gamey flavor, wonderfully balanced by the veggies, as well as its tender consistency. 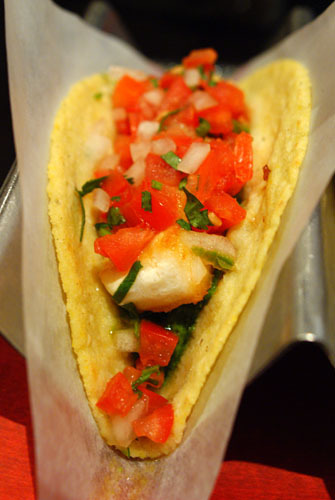 Next we have Oyamel's version of the omnipresent fish taco, with salsa Mexicana and a cilantro pesto. Think light, mildly-flavored fish, perked up by a tangy pico de gallo. This was my favorite of the sextet, a taco of Yucatan-style pit barbecued pork, with pickled red onion and Mexican sour orange. The slow-roasted meat really possessed a profound depth of flavor, beautifully cut by the unabashed tartness of the pickled onion. And here we have what we came for: chapulines, the legendary Oaxacan specialty of sautéed grasshoppers, served with shallots, tequila, and guacamole. The 'hoppers had a fascinating flavor: simultaneously smoky, sour, salty, and earthy, all with a bit of raisin-y sweetness. Not fantastic, but certainly not offensive either. Desserts, in addition to the tacos, were comped, courtesy of Chef Yanev. 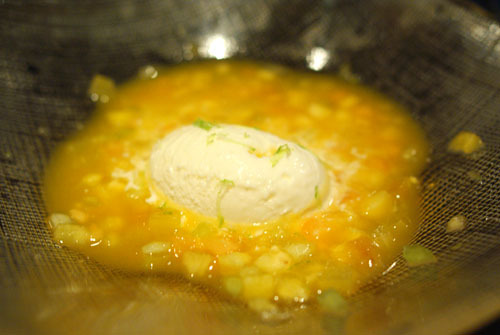 The first was a cold passion fruit soup, with yogurt ice cream and mint. It was a light, refreshing dish, with the richness of the ice cream forming a fitting foil to the bracingly sweet soup. 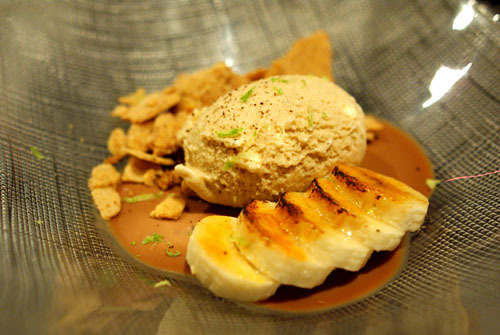 Finally, we were given a coffee ice cream, topped with lime zest, and accompanied by toasted bananas, espresso powder, and cookie crumbles. I'm no fan of coffee, but I certainly didn't mind this dessert. The bananas didn't quite make sense to me, but I did like the zestiness imparted by the lime, as well as the crunchy texture provided by the crumbles. Overall, I quite enjoyed my time at Oyamel. One may complain that the food is too gentrified, and it may be, but the flavors here really work for me--largely light, bright, and bold, with pronounced hints of acid and spice to cut through and complement heavier, darker notes. If I lived in DC, I could see myself making this a return-worthy destination. I give you props, I'm not sure I could eat those grasshopper. The rest of the meal looked like it was pretty standard Mexican fare. 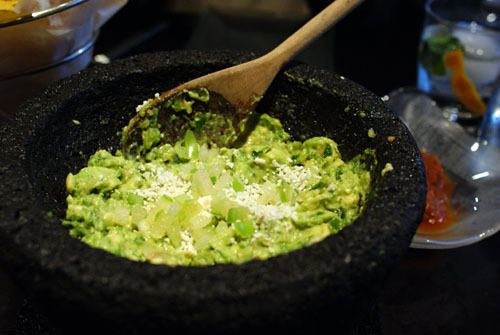 I could always use some good guac! My friend referred me to your blog and it's great! I just started blogging and was wondering what type of camera you used? I'm having an awful time taking pictures in low light at dinner. What's the link to your blog Claire? I'm currently using a Sony a500 DSLR paired with a Sigma 28mm f1.8 macro lens.